Diabetes is a disease in which the body either fails to make insulin or becomes resistant to it. Insulin plays a key role in maintaining the body’s sugar levels by allowing the individual cells to take in sugar. Without insulin, the sugar levels in the blood can climb to dangerous levels. Acutely elevated blood sugar can lead to confusion and even unconsciousness. Chronically elevated blood sugar causes damage to the body’s vital organs. One of the primary ways diabetes affects the organs is through damage to blood vessels by weakening vessel walls. 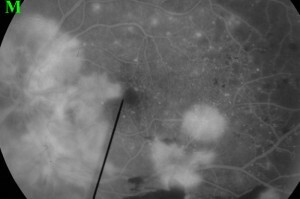 Diabetes can affect the vessels in the retina. The retina is the thin tissue in the back of the eye that senses light. In the presence of high blood sugar levels, the blood vessels in the back of the eye can begin to weaken. The weakened vessels begin to create outpouchings called aneurysms. As the disease progresses, it can also lead to blood leaking out of the aneurysms and causing hemorrhages or areas of swelling in the retina. If the swelling is in the macula (the portion of the retina responsible for central, fine vision) this is called Diabetic Macular Edema. If the vessel clots off, an ischemic injury may occur to a section of the retina. When this happens, the retinal tissue down-stream is deprived of oxygen and the cells will be damaged and will no longer sense light. When this occurs, the body may try to create new blood vessels (neovascularization) to bypass the blockage. Unfortunately, the new blood vessels usually cause more harm than good. The new blood vessels are fragile and leaky and tend to bleed easily. They also can grow in the wrong places, such as into the clear vitreous jelly in the center of the eye or into the drainage system of the eye. If they grow into the vitreous jelly, the vessels can then bleed and cause a blockage of vision (vitreous hemorrhage) or they can pull on the retina and cause it to detach (retinal detachment). If the abnormal vessels grow into the drainage system of the eye, they can create elevated pressures inside the eye which can lead to glaucoma. What testing can be done to detect diabetic retinopathy? When you come in for a dilated eye exam, we can see many of the findings of diabetic retinopathy by looking at your retina. 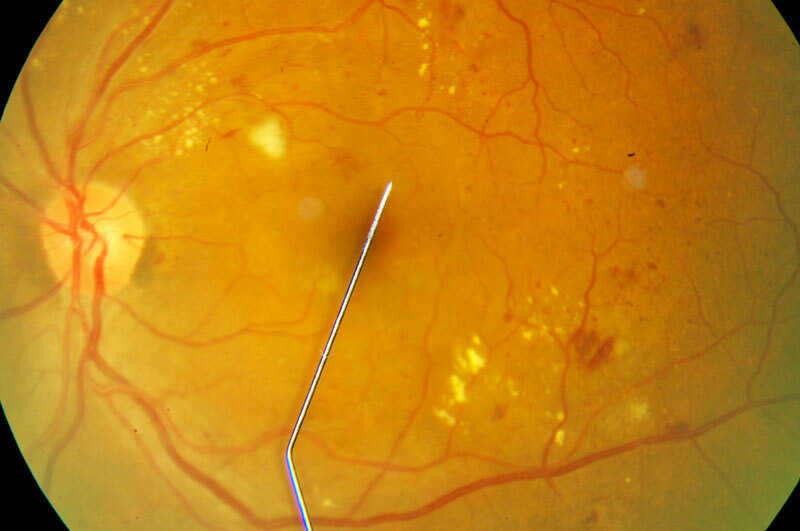 Depending on the severity of the diabetic changes, other tests may be necessary to identify abnormal blood vessels or areas of retinal swelling. Fluorescein angiography is a test to help identify abnormal or leaking blood vessels. In this test, a dye is injected into the veins in the arm. Then a camera with a special filter takes pictures of the retina as the dye passes through the blood vessels. Ocular coherence tomography (OCT) is another test which creates a very high resolution cross sectional image of the retina. These images can help to identify small areas of bleeding or swelling. How often should I be checked for diabetic changes? How can I prevent diabetic retinopathy from developing? Maintaining a good blood glucose level is the best way to prevent diabetic retinopathy. The longer you have had diabetes and the higher the average blood glucose levels, the more likely you are to develop diabetic retinopathy. Many studies have demonstrated that lowering blood glucose levels with exercise, oral medications, or injectable insulin can help to delay or prevent diabetic retinopathy. For most patients, a hemoglobin A1c level of less than 7% is a good target. Additional studies have demonstrated that good control of blood pressure and blood lipids (cholesterol) can help slow the progression of diabetic retinopathy. In the early stages of diabetic retinopathy, emphasis is placed on prevention by encouraging better blood glucose, blood pressure, and cholesterol control. However, once neovascularization or diabetic macular edema develops these must be treated to prevent further vision loss. Diabetic macular edema occurs when the retina becomes swollen from blood, plasma, or lipids leaking from microaneurysms in damaged blood vessels. If it occurs in the central retina (macula), it can create distortion and blurred vision. One treatment for diabetic macular edema is to use a very fine laser to coagulate the microaneurysms and prevent them from continuing to leak. This is called retinal photocoagulation. Another treatment is to inject an anti-VEGF medication into the eye. VEGF (vascular endothelial growth factor) is a chemical created by injured retinal cells which causes new abnormal blood vessel formation. It also causes the blood vessels that are already there to become more leaky. By injecting an anti-VEGF medication, this chemical signal is blocked. Proliferative diabetic retinopathy occurs when areas of the retina are not receiving enough oxygen. The cells become damaged and start to release VEGF and other molecules. These molecules signal the body to try to make new blood vessels to bypass the abnormal or clotted vessels. This process is called neovascularization. Unfortunately, the new blood vessels do not function properly and can lead to loss of vision due to bleeding, retinal detachment, or severe glaucoma. Treatments for proliferative diabetic retinopathy are aimed at preventing neovascularization by interrupting the chemical signal for the new blood vessel growth. For about 30 years, the standard of care for proliferative diabetic retinopathy has been panretinal photocoagulation. This involves using a laser to burn and destroy the damaged and non-functional retinal tissue which is causing the release of VEGF. A laser is used to create hundreds of burns to the peripheral retina. This destroys the source of VEGF and causes the new blood vessels to retreat and prevents new ones from forming. 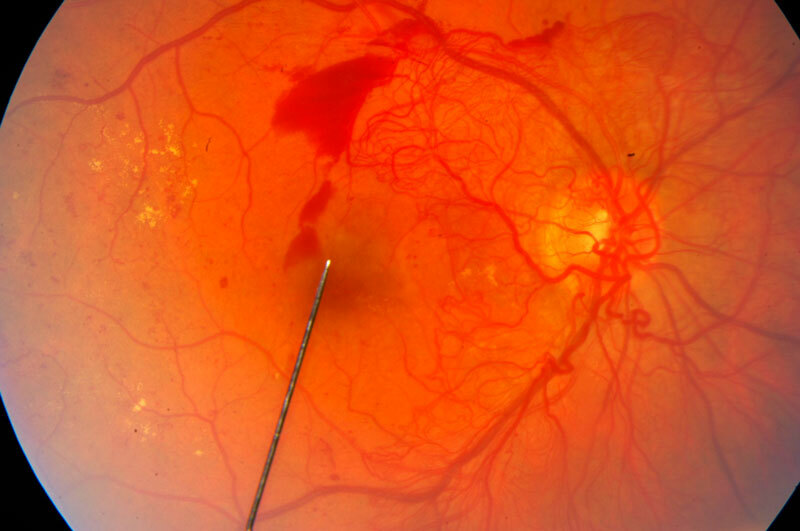 Recently, there have been many studies showing the benefit of injecting anti-VEGF medications into the eye in addition to panretinal photocoagulation for the control of proliferative diabetic retinopathy. If proliferative diabetic retinopathy progresses, it can lead to bleeding into the clear vitreous jelly of the eye (vitreous hemorrhage). The abnormal vessels can also pull on the retina and lead to a retinal detachment. For either of these conditions, it may be necessary to see a retinal specialist to undergo a vitrectomy. A vitrectomy is a surgery where the surgeon will use micro-instruments to remove the jelly from the inside of the eye. At that time, he can also remove any vitreous hemorrhage, repair the detached retina, and may also perform additional photocoagulation of the retina.